Heat half the oil, broth, or water in a stir-fry pan or wok. 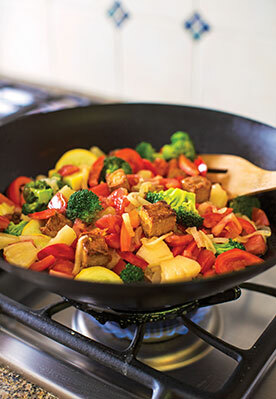 Add the seitan or tempeh and stir-fry over medium-high heat until lightly browned, stirring frequently, about 5 minutes. Transfer to a plate and set aside. Heat the remaining oil, broth, or water in the pan. Add the onion and sauté over medium heat until golden. Turn up the heat; add the garlic, broccoli, and bell peppers and stir-fry for 5 minutes. Stir in the courgette and stir-fry just until everything is tender-crisp, about 2 minutes longer, then stir in the tomatoes and pineapple chunks. Combine the sauce ingredients together, stir in the sauce and cook until it thickens. Taste and adjust the sweet-sour balance with more agave and/or vinegar to your liking. Serve at once over hot cooked grains or noodles. Why 1lb of seitan but just 8oz of tempeh? Seitan is more moist and less dense; 1lb of tempeh would be quite intense in this dish. But if you’re a big fan of tempeh and want a higher-protein dish, go for it – use two 8oz packages.